Juice fasts, juice diets and detoxes have become a popular way to jump-start weight loss and lose some quick pounds. By not eating any foods, you allow your digestive system to take a break and clear out many of the processed foods consumed in America today. A juice fast consists of drinking naturally juiced fruits and vegetables and water while eating no solid foods at all. The average juice fast lasts for three to 10 days, though some people will fast as long as 30 days. 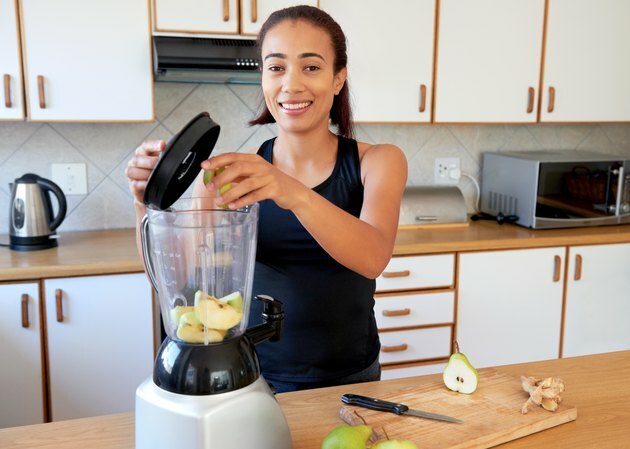 According to Fitness Through Fasting, an average person can lose 10 pounds or more within the first seven days of a juice fast. As with any diet, precautions should be taken. Before beginning any type of juice fast, consult with your physician. Because you will not be eating any solid foods, your physician may need to change or adjust prescription medications and may recommend vitamin supplements for you to take while fasting. Purchase a top quality juicer. Take into consideration things like how easy it is to use and clean, how durable it is to be used on a regular basis and the cost you can afford. You will be using this numerous times throughout the day, so make sure it is one you can easily work with. Purchase an assortment of fresh and preferably organic vegetables and fruits to juice. Fruits like apples, pears, grapes and pineapple provide lots of vitamins and nutrients and are easy to juice. Vegetables like cabbage, lettuce, wheat grass, celery, beets and most green vegetables are also recommended. Add things like ginger or lime to make certain juice mixtures more palatable. Many green vegetables do not produce the best flavor when juiced, so mixing them with fruit or adding spices can help. Make your juice fresh at the time you plan to drink it. You will need to drink at least 35 to 70 ounces of juice a day, so breaking that up into mini “juice meals” will make this easier. Storing juice is not recommended because it loses some nutritional value as it sits. Drink at least eight glasses of filtered or purified water a day in addition to the juice drinks in order to keep your body hydrated. Gradually begin eating food once your fasting time is over. Your body is not used to processing solid foods, so it is not a good idea to go right out and order a big hamburger. Gradually add fruit and vegetables on the first day and then add grains and protein as your body can handle it. Detox and juice fasting diets can be a good way to jump-start a weight-loss program but they are not designed for long-term use. The best diet for optimal health and weight includes a balance of fruits, vegetables, whole grains and proteins accompanied by a balanced exercise program.